Indian Prime Minister Narendra Modi announced an emergency address that 500 and 1000 rupee notes are discontinued in the country from yesterday. This is the decision taken against corruption and black money in India. 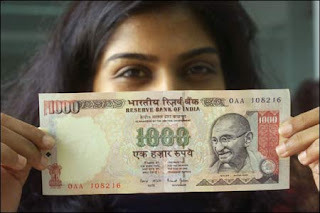 Government decided to scrap all the Rs.500 and Rs.1000 currency notes. 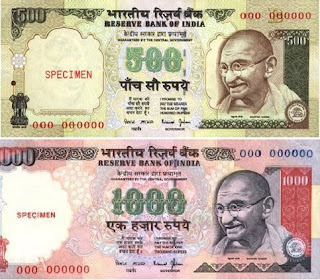 Most of the people using 500 and 1000 notes for hiding as black money are now banned in India, you cannot use the old currency notes anymore. amount of 500 Rs and 1000 Rs notes without any limit. You can deposit your old rupee notes till December 30 only. * After December 30, you will be allowed to exchange in RBI offices with special declaration. * Also there is no restriction on Internet Banking, Demand Drafts and Cheques. So you can use this as much as to exchanging your money with online wallets like Paytm, MobiKwik and more. * You can exchange old 500 and 1000 rupee notes in Banks and Post offices till December 30th 2016. Go to your nearest Bank or Post office with your valid ID Proof such as Aadhaar Card or PAN Card or Voter Identity Card. * You have to Fill up a form named as Request Slip with your Name, ID Proof and denomination details. * The limit for exchanging notes is Rs.4000. So you can exchange currency notes upto Rs.4000. * You are only allowed to withdraw Rs.2000 per day and you can withdraw maximum of Rs.20000 per week. * This ATM Withdraw limit is till November 24th 2016, after the limit will be increased by Government. * No Toll Entry fee in National Highways till November 11. * New Currency notes of Rs.500 and Rs.2000 will be introduced from today. * New Currency notes of Rs.500 and Rs.2000 does not have any chips technology.